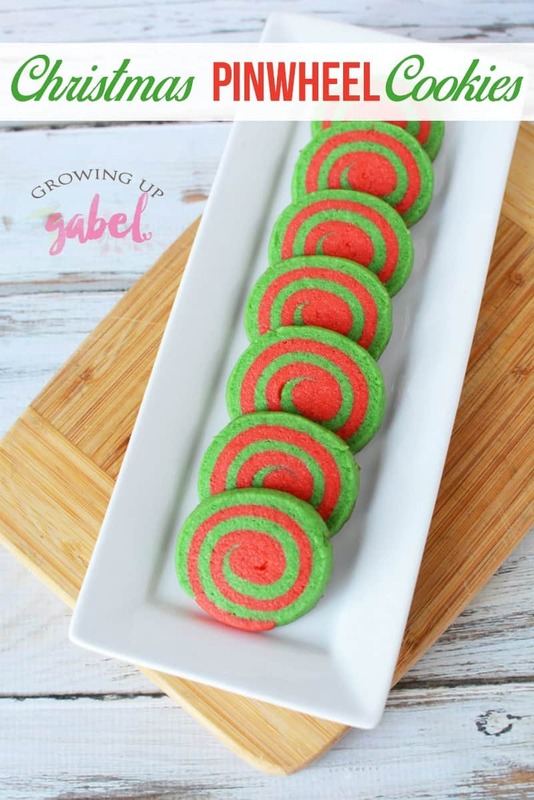 Festive red and green Christmas Pinwheel Cookies are fun and easy to make from a basic sugar cookie dough. Just roll, layer, slice and bake. 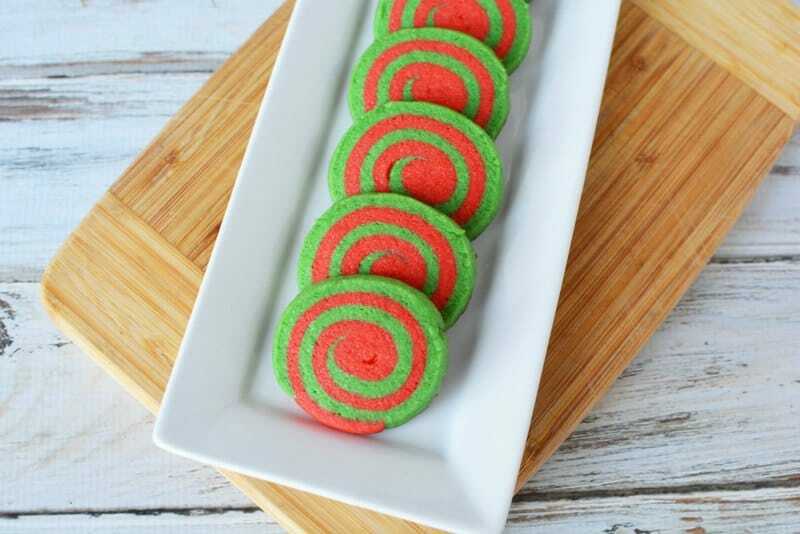 When I was a kid, I was fascinated by those red and white candy cane cookies. I even tried to make them when I was in high school and they were a total flop. I don't remember much of what went wrong but I do remember them being hard to make. 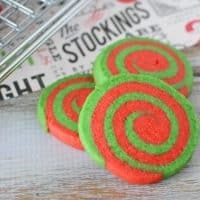 Not so with these Christmas pinwheel cookies! They are much easier to make. 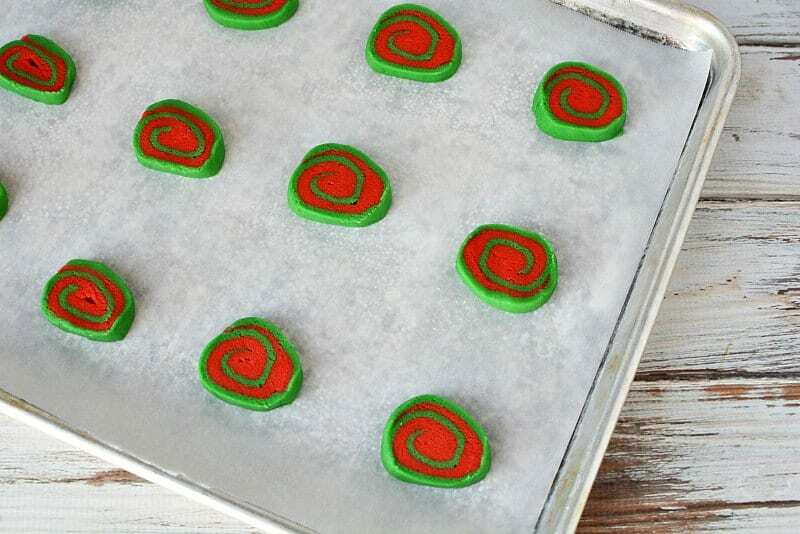 They still take few extra steps, but the resulting green and red pinwheels are a great addition to a Christmas cookie tray. Begin by making the cookie dough. Add flour, baking powder, salt and baking soda to a small bowl and mix well. Add butter and sugars to a mixing bowl and cream, on medium high speed, until light and fluffy. Beat in egg and vanilla. Add in flour mixture until dough forms. 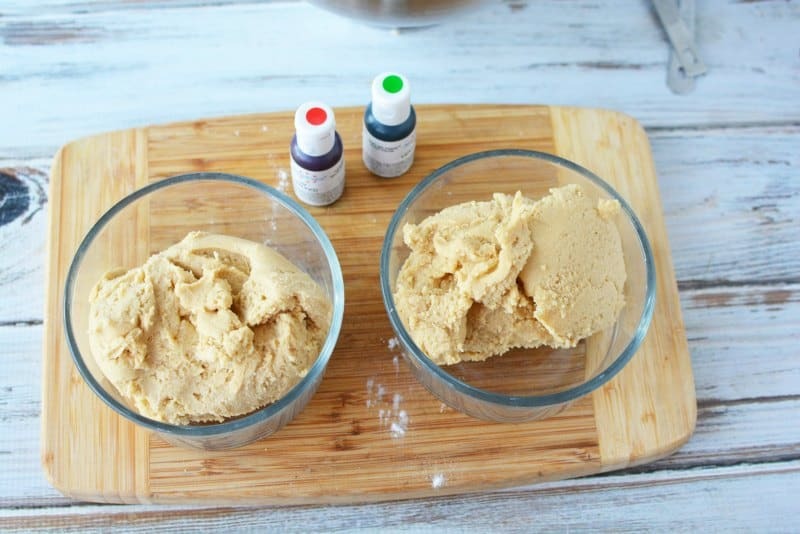 Divide dough in half and put in to two separate bowls. Or just leave one half in the mixing bowl and put the other half in a different bowl so you'll have less dishes to do. Add green coloring and beat until evenly colored. Rinse beater and bowl and dry. Add remaining dough and red coloring and beat until combined well. I prefer to use gel food coloring. It gives a much better color with much less food coloring. Use a toothpick and just put a little bit of coloring in the dough at a time until you get the color you want. Once each half of the dough is the color you like, divide each of the colored doughs in half again. 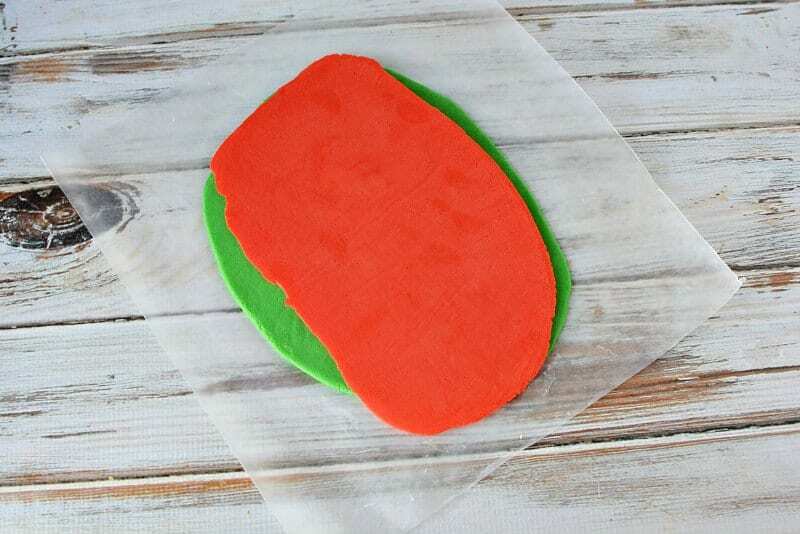 Put each 1/4 of the dough on it's own wax paper sheet.b Roll each part (2 red and 2 green) flat between 2 pieces of wax paper about 1/4″ thick into a 9 x 6 rectangle size. Keep the dough pieces on their wax paper sheets and refrigerate for about 15 minutes. 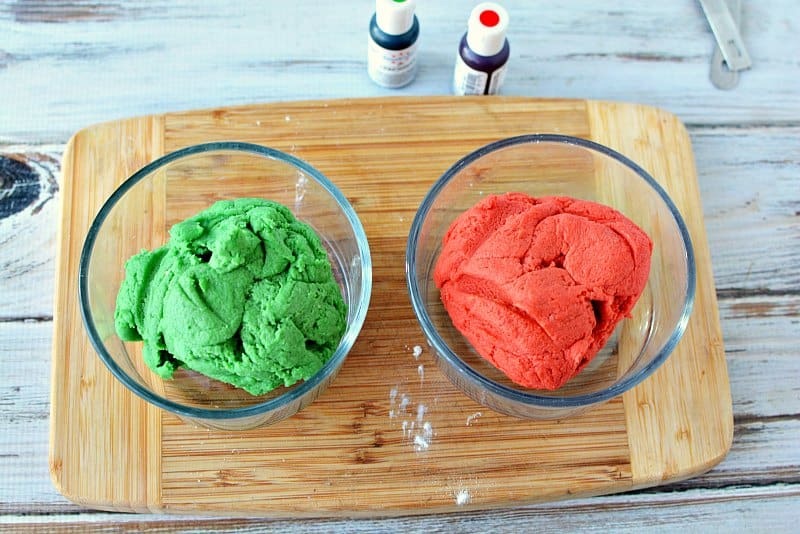 After 15 minutes, remove dough from the refrigerator and place a red on top of a green dough. Gently begin to roll from the short end to create a log. Repeat so you have two logs. Wrap each log securely in wax paper and return to the refrigerator for an hour. When you're ready to bake, preheat oven to 375 and line a baking sheet with parchment paper. 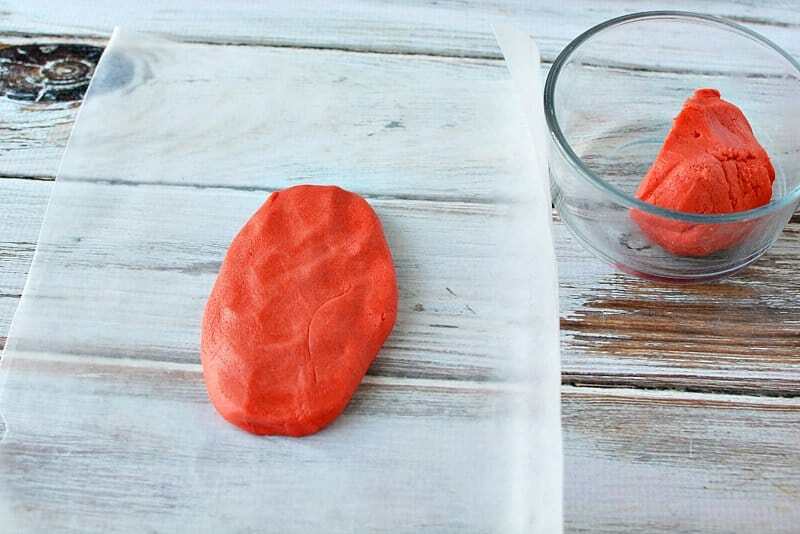 Unroll dough from wax paper and slice into 3/8 inch sections. Place onto a cookie sheet, 1″ apart and bake for 7-9 minutes or until set and bottoms just begin to brown. Let cool completely on a wire rack. 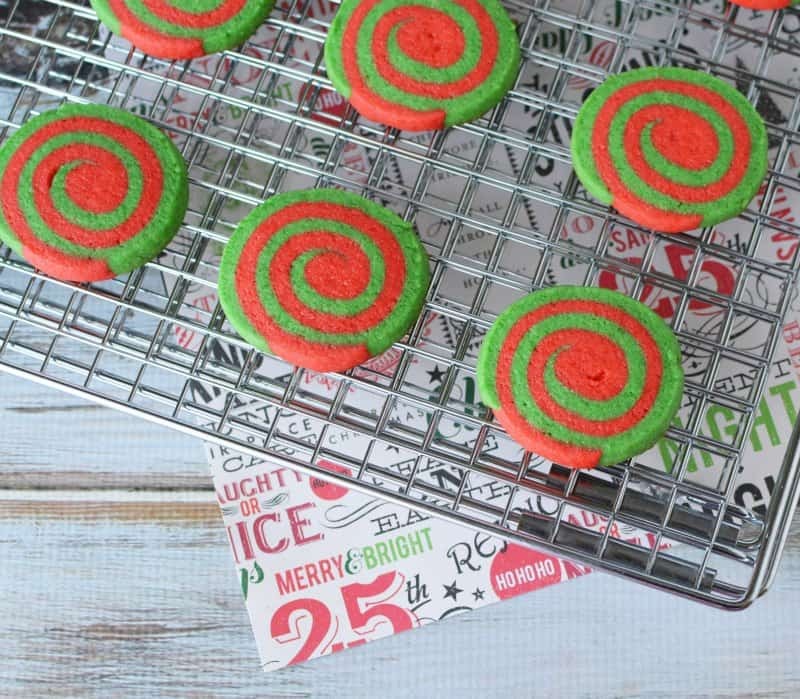 The recipe makes 2 dozen if you slice the cookies at 3/8″. If you slice into 1/4″ sections, try baking 5-7 minutes and checking. You'll get about 4-5 dozen cookies. Store in an air tight container to keep them fresh. Add flour, baking powder, salt and baking soda to a small bowl and mix well. 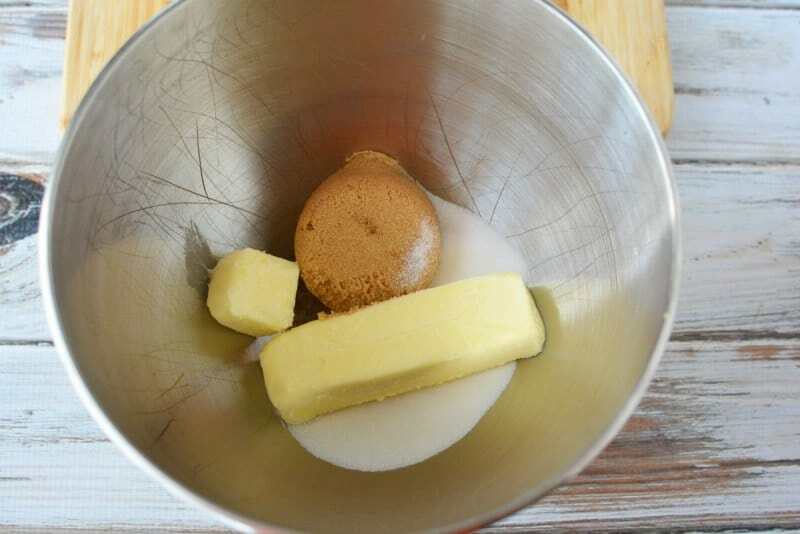 Divide dough in half and remove half from the large mixing bowl. Add green coloring and beat until evenly colored. Rinse beater and bowl and dry. Add remaining dough and red coloring and beat until combined well. 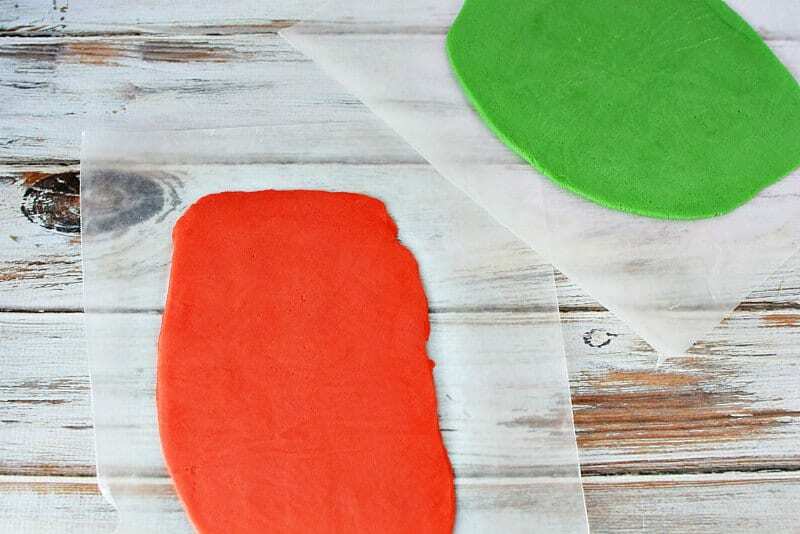 Divide each of the colored doughs in half and roll flat between 2 pieces of wax paper about 1/4" thick and 9x6 rectangle size. Repeat until you have 4 flat pieces. Refrigerate for about 15 minutes. 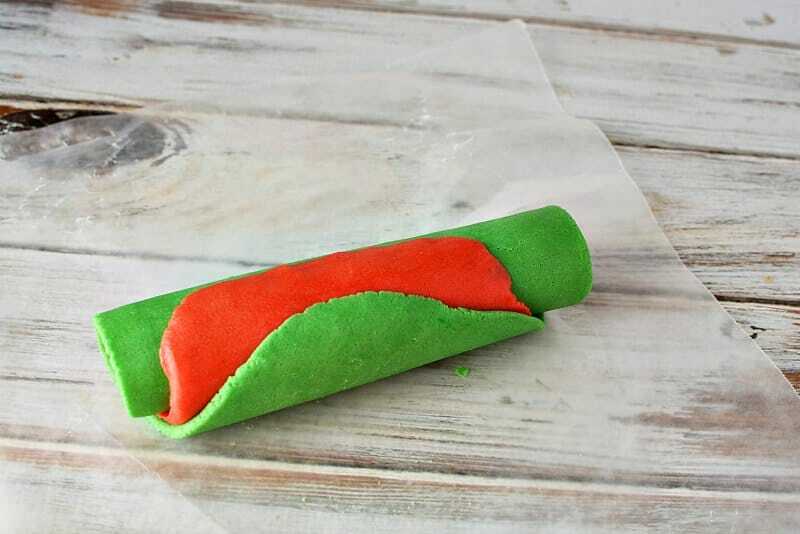 Remove dough from the refrigerator and place a red on top of a green dough and gently begin to roll from the short end to create a log. Repeat so you have two logs. 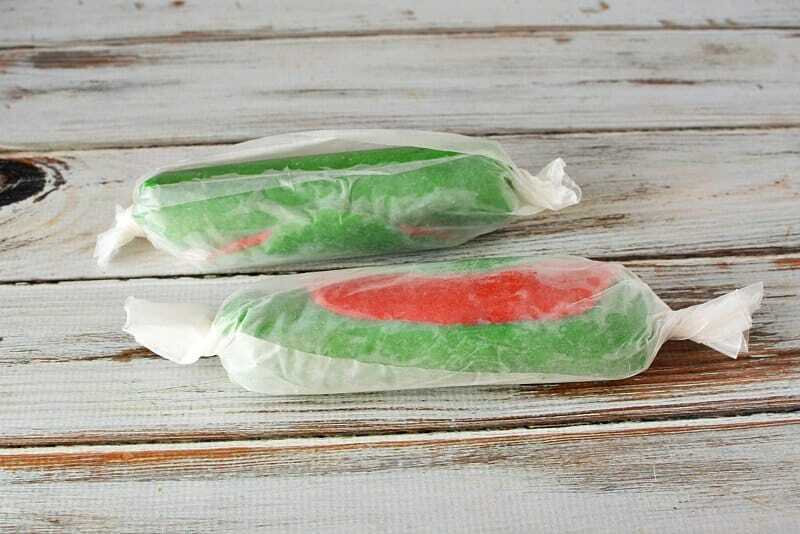 Wrap in wax paper and return to the refrigerator for an hour. 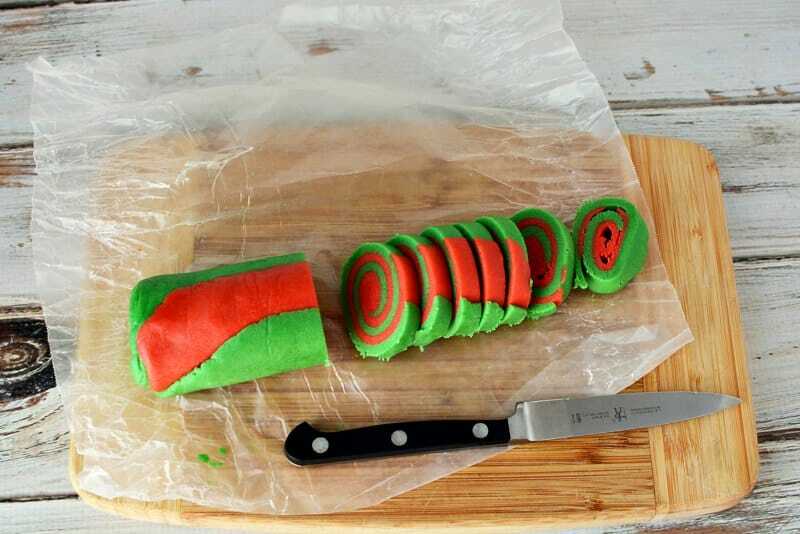 Unroll dough from wax paper and slice into 3/8 inch sections. Place onto a cookie sheet, 1" apart and bake for 7-9 minutes or until set and bottoms just begin to brown. Let cool completely on a wire rack. If you slice into 1/4" sections, try baking 5-7 minutes and checking. You'll get about 4-5 dozen cookies. Such bright and seasonal cookies. The recipe looks delicious too! Thanks for sharing with Fiesta Friday. 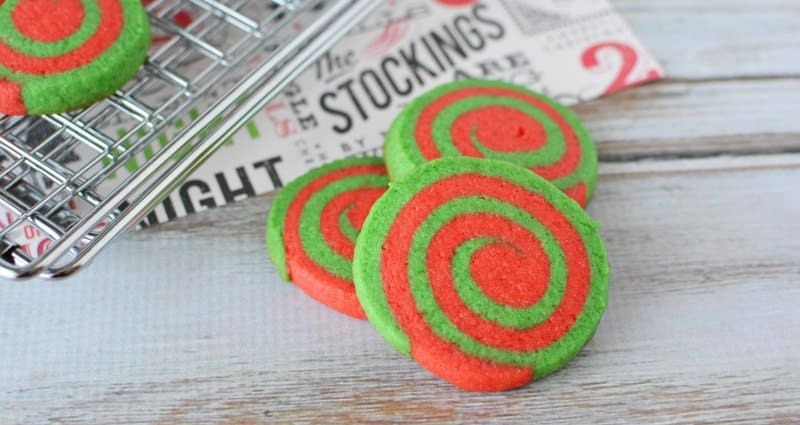 We will really enjoy your awesome Christmas Pinwheel Cookies! Hope you have a great week and thanks so much for sharing with Full Plate Thursday! Truly festive looking cookies! 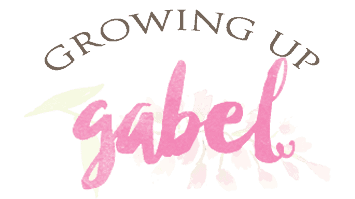 Thanks for sharing at Fiesta Friday – please don’t forget to add the three links to the party so your readers can join us! I love the look of these cookies. So festive! These are so pretty – and you make it look so easy to do! I think I need to try it for our Christmas celebration! 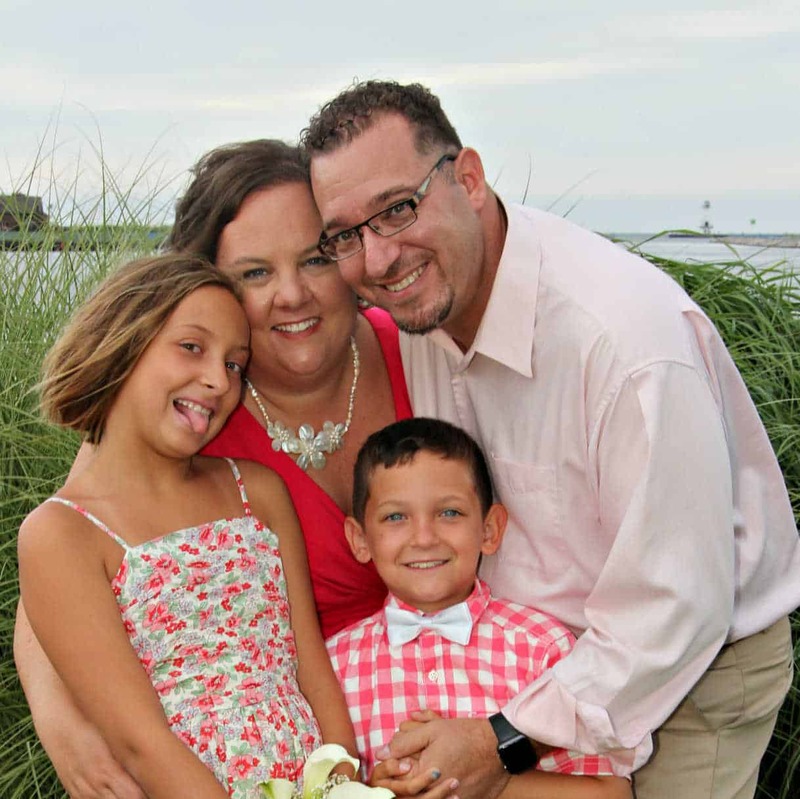 Thanks for sharing at the What’s for Dinner party! Such bright and colourful cookies! Hi Maria – The recipe is on the bottom of the post!